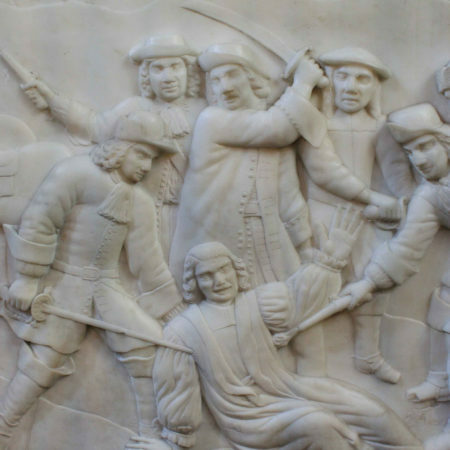 The monument of this month commemorates both an archbishop and a political murder. James Sharp was born at Banff Castle in 1618 and studied at King’s College, Aberdeen. By 1642 he was a regent at the University of St Andrews and in 1648 he became the minister at Crail. He married Helen Moncrieff with whom he had seven children. 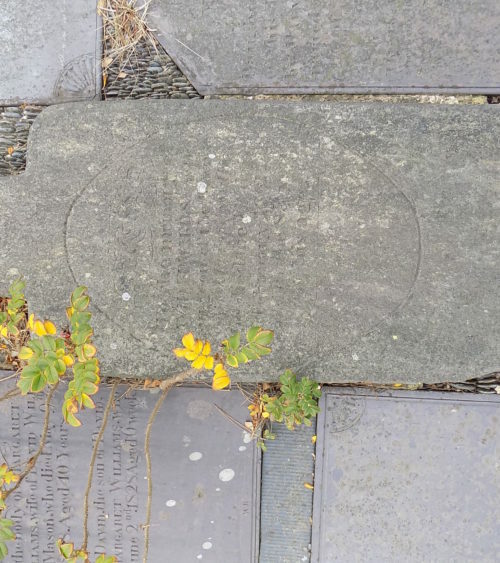 Originally a moderate and a mediator in troubled times, Sharp is now best known in local folklore for his murder in 1679. 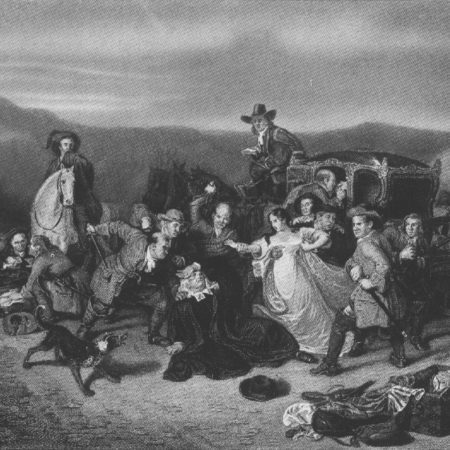 Throughout Sharp’s life there were movements in Scotland against the monarchy, eventually leading to the Civil War. Moreover, the Reformation had left deep rifts between Catholics and Protestants. 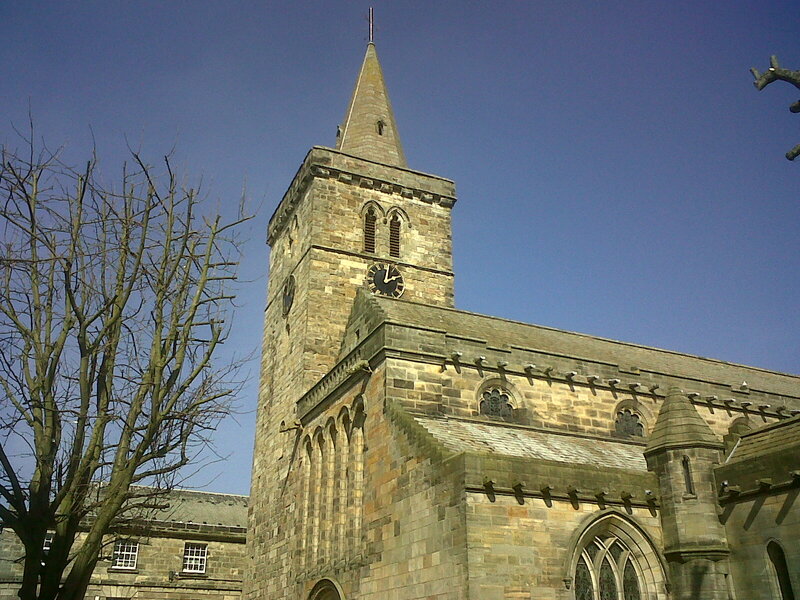 The Episcopalian Church was seen as a Catholic religion headed by the monarchy and its allies. 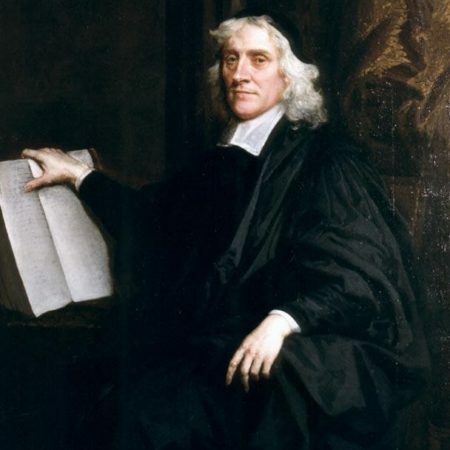 It is thus that, in the aftermath of both Reformation and Civil War, Sharp’s decision in 1661 to become episcopalian archbishop and primate of all Scotland was regarded as a betrayal of presbyterianism (a minimalist form of Protestantism) and caused him to be seen as a self-interested turncoat. 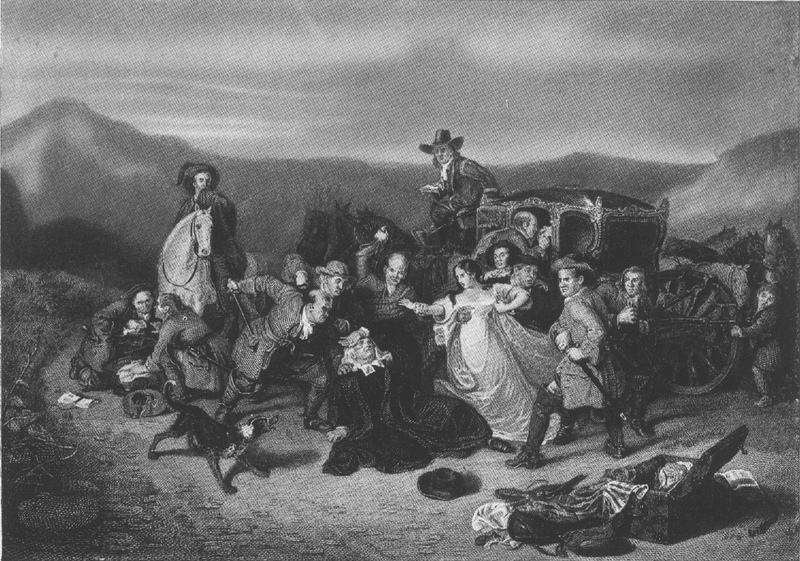 Things came to a head on 3 May 1679 as a band of presbyterian conventiclers set out to scare a local sheriff for some authoritarian wrong he had done them. When the sheriff failed to turn up, the men got wind of the Archbishop passing close by on his way from Cupar to St Andrews, and seized this new opportunity to flex their muscles. Riding swiftly across the barren Magus Muir they pursued the Archbishop’s carriage and, having overtaken it, held his daughter while they fell upon Sharp hacking at him until the fatal shot was fired into his chest. Their momentum had taken them too far. Unsurprisingly, the event was seized upon by both sides as representative of their own glory and the other side’s godlessness. The murderers justified this vicious whim as God’s will. They claimed that God had sent them the Archbishop. 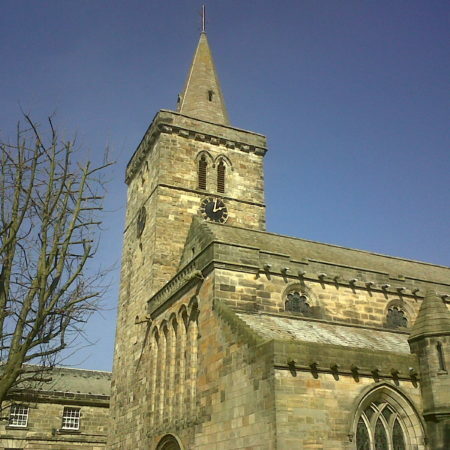 In St Andrews, meanwhile, the Archbishop was buried at Holy Trinity church as an episcopalian martyr. 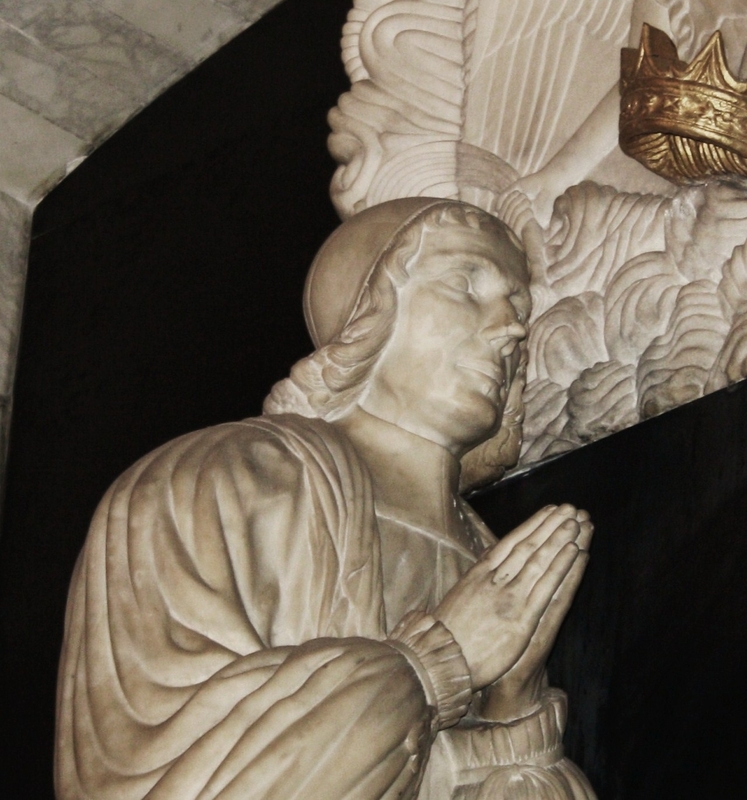 Still occupying most of the east wall of the south transept is a wall monument commissioned that same year by Sharp’s son, Sir William Sharp of Scotscraig, to tell the story of his father’s murder and celebrate his martyrdom. The unknown sculptor may have been Dutch or at least trained in the Netherlands. Sir William had two main agendas. The first was to commemorate his father as a martyr rather than a turncoat. The second was to establish his family’s heritage by thus celebrating his father’s privileged status as archbishop. The Restoration introduced a new aristocracy whose members felt pressured to justify and consolidate their positions by devising noble family histories for themselves and thereby claiming a place in public memory. 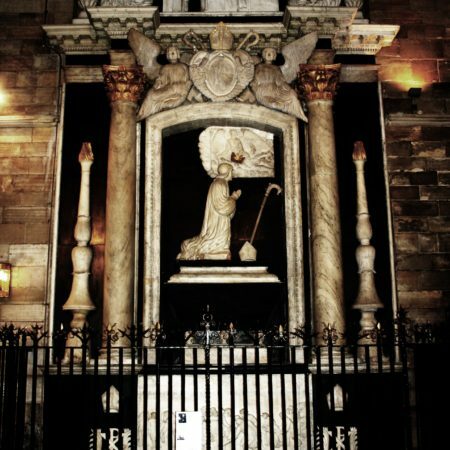 Numerous – sometimes entirely fabricated – family tombs and portraits were created across the country, and Archbishop Sharp’s was no exception. Sharp’s monument consists of three tiers. 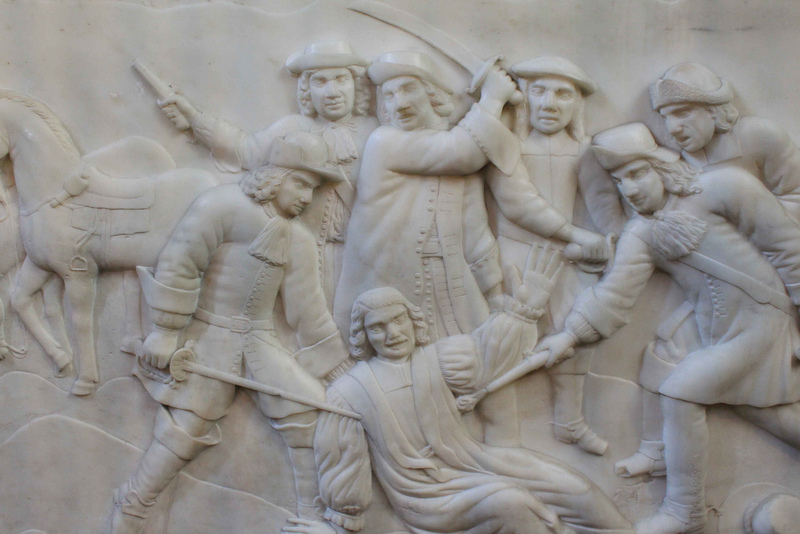 The lower tier holds a marble relief of the murder, which depicts the Archbishop calm and serene as he is martyred, his raised hand reminiscent of many Renaissance and Baroque martyr scenes. Flanking the relief are two Chi Rho monograms each crowned with archiepiscopal mitres and framed by martyr’s palms. The Chi Rho is an old Christian symbol for Christ and arguably associated with Catholicism. Above this lower tier, resting on three skulls, is a sarcophagus flanked by two grandiose marble pillars and two torches. The skulls act as a memento mori to remind us of the temporary nature of all things physical. Indeed, the overt presence of the sarcophagus may be seen as conveying a similar message: the body is here, and there is no denying that it is a corpse. 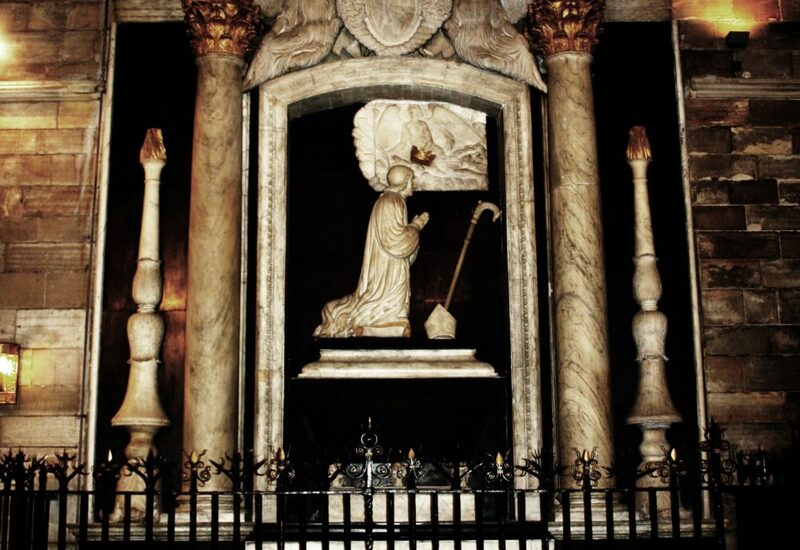 The monument’s centre piece is a full-size marble sculpture of the archbishop kneeling on top of his sarcophagus. An angel hands him a martyr’s palm and crown. 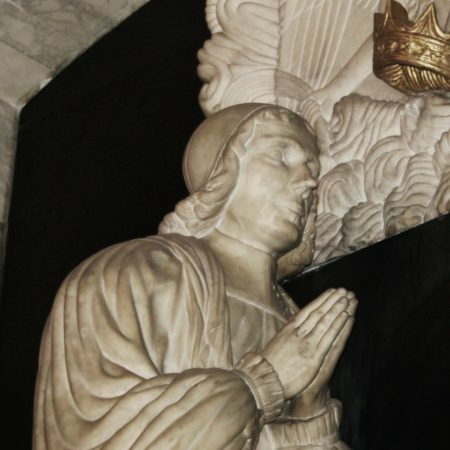 Sharp kneels before heaven dressed not as an archbishop but as a simple minister, indicating that he is being crowned not for his archiepiscopal status but for his virtue – a remarkably Protestant concept in principle: one wonders whether this reflects Sharp’s own beliefs or whether it is a posthumous attempt to quell his enemies’ hatred of him as a turncoat. Nonetheless, his mitre and staff are very much present lest anyone forget, even in this pure heavenly moment, that this was an archbishop. Above the archbishop’s figure is his coat of arms, crowned with a mitre and supported by two angels. 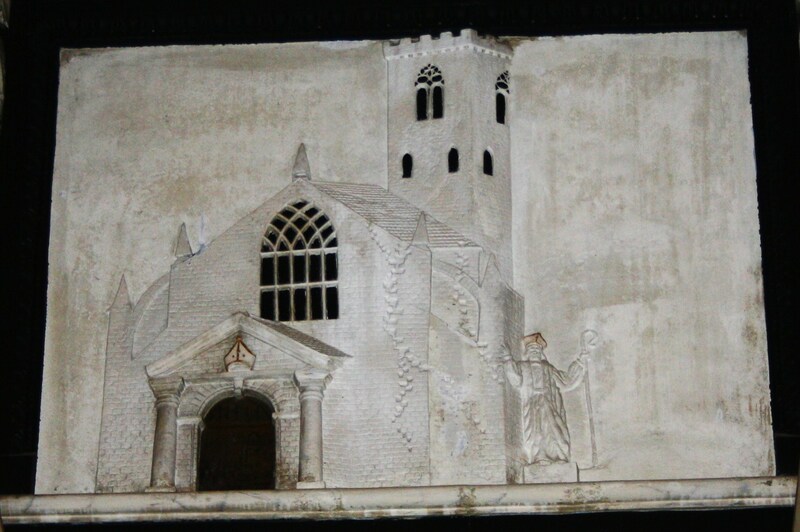 The upper tier features a relief of what we may guess to be a fanciful reconstruction of the church of St Regulus at St Andrews, the remains of which still stand next to the cathedral. 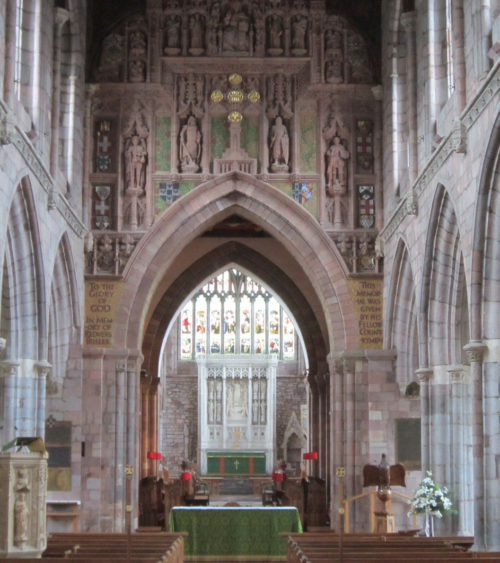 The archbishop stands beside it in full archiepiscopalia, underlining once more his status as a virtuous father of his church and archbishop of St Andrews. 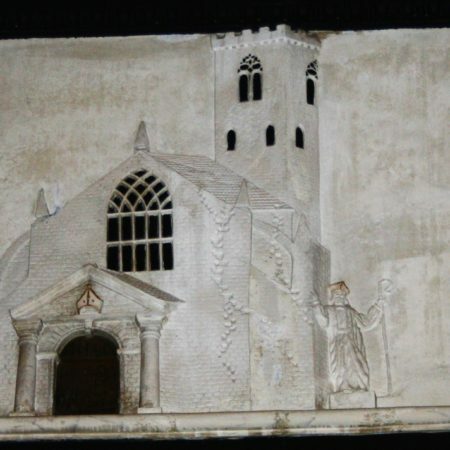 Although the monument is imposing in size, elaborate in design, and made of costly materials, it cannot be described as a work of high artistic quality. The figure of the archbishop is not only rather disproportionate, but also lacking in detail and life-likeness. The decorative angels are stiff and graceless, the murder scene is less dramatic or glorious than awkwardly clumsy, while the whole composition seems out of tune and disjointed. If this was the work of a Dutch (or Dutch-trained) sculptor it is very second-rate compared to the monuments by the great Dutch sculptors of the time, such as Rombout Verhulst and Bartholomeus Eggers. Nevertheless, the monument tells the story of a notorious and symbolic political event at a turbulent, crucial time in Scottish history. Indeed, the monument’s size, luxury and loud episcopalian symbolism contrasts sharply with the church’s quiet Protestant decor. This in itself is a poignant reminder of the town and country’s deep religious conflict of the time. 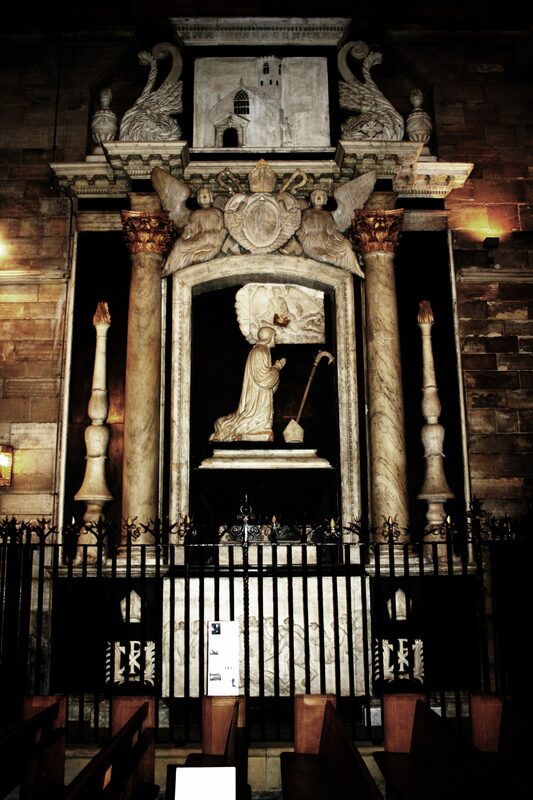 The memorial to Archbishop Sharp must therefore be considered an important monumental highlight in the university town of St Andrews. This piece was based on my Art History undergraduate dissertation ‘The Various Images and Bodies of a Man: Archbishop James Sharp’ at the University of St Andrews (2011) supervised by Dr Sophie Oosterwijk. 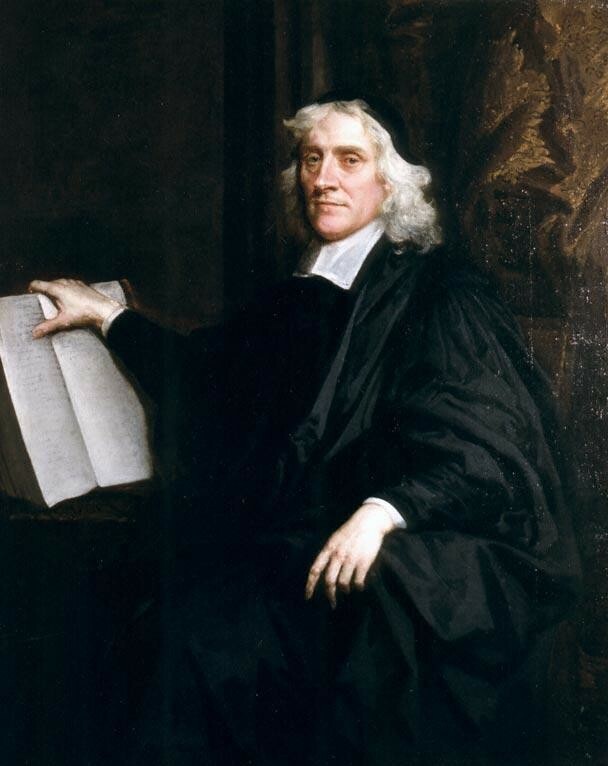 Julia Buckroyd, The Life of James Sharp, Archbishop of St. Andrews, 1618 to 1679: A Political Biography (Edinburgh: John Donald Publishers, 1987). Nigel Llewellyn, Funeral Monuments in Post-Reformation England (Cambridge: Cambridge University Press, 2000). Rev. W.E.K. Rankin’s notebook, ‘Old St Andrews’, Article V, held in the University of St Andrews Special Collections. Peter Sherlock, Monuments and Memory in Early Modern England (Aldershot: Ashgate, 2008). 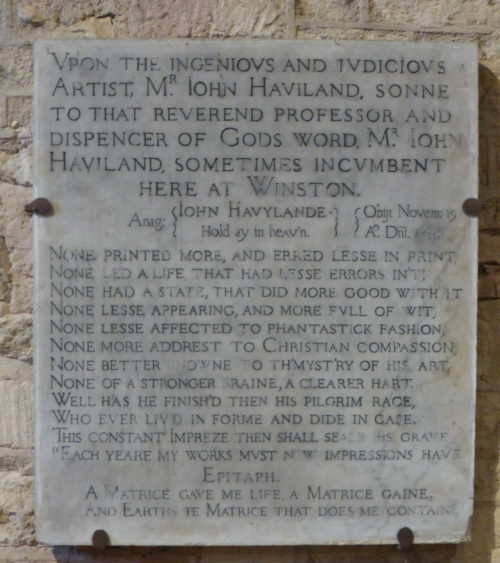 Memorial to John Haviland, Printer (1589-1638), in St. Bartholomew’s church, Winstone, Glos.